I think I’ve tried Sushi (or a California Roll) once in my life – and I honestly didn’t care for it that much. I think it was the seaweed. Never had much experience with seaweed growing up in Indiana. But after reading about an experience with a fellow WFPB reader regarding her iodine levels, I thought what better way to get some added iodine into my diet than giving Homemade Vegan Sushi one more chance. All sea vegetables are very high in iodine with the added benefit of Vitamin A, Magnesium, and Potassium, so they are actually quite healthy. My daughter absolutely loves Sushi and was super excited when I told her I was going to try to make some. And….Sushi is easy to make……. well, kind of. 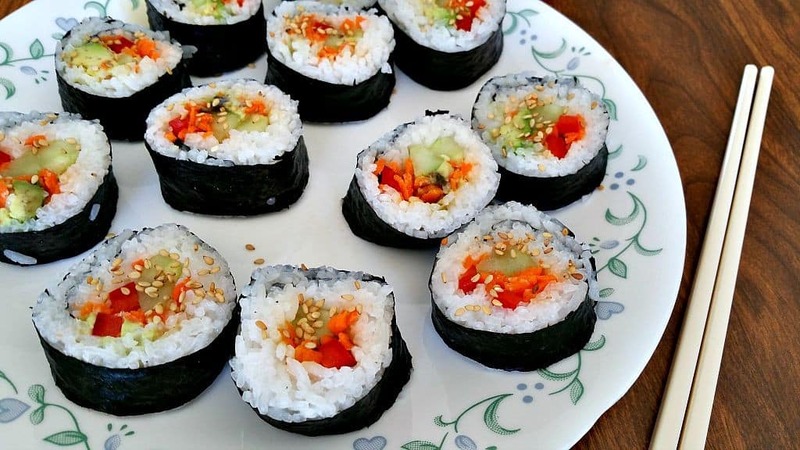 The ingredients are easy, some Nori Sheets, Sushi Rice, and your choice of veggie fillings. But the ROLLING of the Sushi – well that can be a challenge. But trust me, if I can do it, so can you. Let’s start with the Nori. You’re going to need some sheets of dried Nori Seaweed. Now I found mine at my local grocery store in the Asian Section near the Soy Sauce, Rice Noodles, etc. If your grocery doesn’t carry it, look and see if you have an Asian Grocery Store nearby, they will be sure to carry it. I’ll also provide some links to Amazon where you can order Nori and other supplies online. Yes, these are affiliate link so I have to tell you if you click on them and buy anything, I do receive a small compensation. Ok, legalities aside, here’s a link to Organic Nori on Amazon. Next, you’ll need some Sushi Rice. Sushi Rice is a short to medium grained white rice that we’ll season after cooking. I’ll provide a recipe below. Basically, you’ll need 2 cups of rice, 2 cups of water, sugar, salt, and some Rice Vinegar. Jasmine Rice and Basmati Rice are both long grained rice, so stick with a Japanese medium grain for making Sushi. This is also called ‘sticky’ rice. You want your rolls to stick together when they are done, not fall apart. The other secret to good Sushi Rice is rinsing. Make sure you rinse your rice several times until the water runs clear before cooking. I used 2 cups of rice with 2 overflowing cups of water and mine came out perfect. 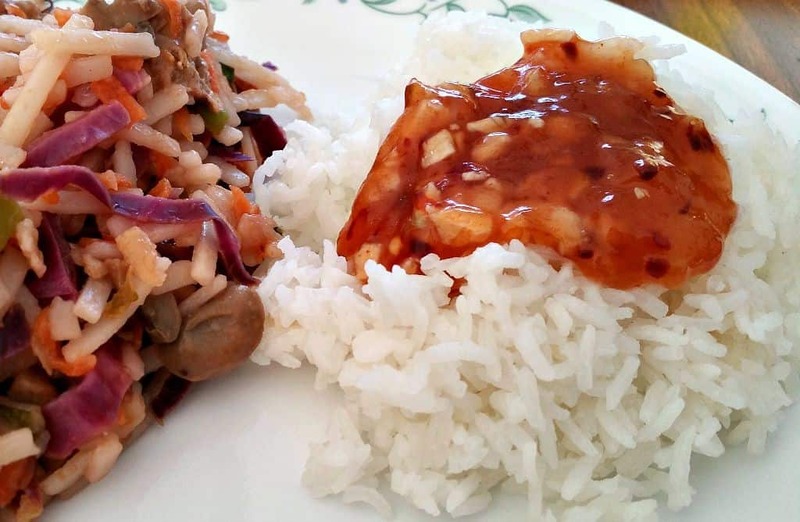 Once your rice is done cooking, transfer it to a nonmetallic bowl. Traditionally a wooden bowl is used, but just so long as it’s not metal as the vinegar we’ll be adding will react with metal. Not good. In a small jar mix 3 Tbls Rice Vinegar, 3 Tbls Sugar, 1 Tbls Mirin, and 2 tsp of salt. Give that a good thorough mixing until everything dissolves, and then mix this in with your rice after it’s cooled. Carefully use a wooden spatula to gently mix your rice, using cutting motions. You want to gently mix it, not smash it or otherwise destroy the grains. The cool thing about Homemade Vegan Sushi is you can add whatever filling you like. I used peeled cucumber strips, shredded carrot, strips of red bell pepper, and avocado. My informed, daughter told me traditionally they use Soy Sauce and Wasabi as dipping sauces in all the hip Portland Sushi joints. Rather than experiment with yet another new ingredient (Wasabi) I chose to use my tried and true recipe for Thai Sweet Chile Sauce which came out perfect. And in case you didn’t know, Wasabi is powder made from hot Japanese Horseradish. Maybe we’ll try that one day. However, if you are the adventurous type – then by all means – knock yourself out. Yes, there is such a thing as a bamboo Sushi Mat. These are placemat looking things that are used to roll your Nori into those familiar California Roll shapes. I went to 2 different stores looking for one and came up empty-handed. So I used a towel. And it worked fine, but it was a bit messy. I think I will definitely be investing in a Sushi Mat if I continue to make this from time to time. But for the towel method, using a clean kitchen towel, lay your Nori Sheet rough side down along the bottom edge. Now using your wet fingers (have a bowl of water nearby) press your cooled rice into the Nori Sheet from edge to edge keeping the thickness about 1/2″ thick. Leave a small 1″ strip along the top bare to help it seal. 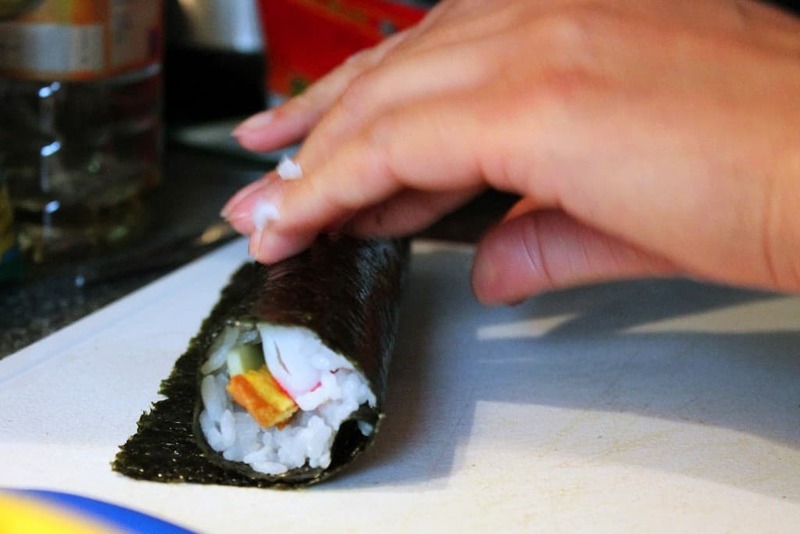 Once your rice is down, lay your veggie strips along the length of the Nori near the bottom and carefully roll upwards. The towel helps you to roll uniformly. Unfortunately, I was so caught up in the moment of making sushi, I forgot to take pictures (plus my hands were all covered in sticky rice). So here is a photo that hopefully shows the process – minus the towel. Go slow, and stop to firmly squeeze your roll from time to time to ensure everything sticks together. When you get to the end, wet down that last little strip of Nori before you complete the roll and it should seal fine. One your roll is done, set it aside to rest while you make the remaining rolls. Using a sharp knife, wet down the blade and cut your roll into 2 even pieces. Remember to constantly clean your knife under running water and then cut each piece down the middle again. Repeat until you have 8 uniform California Rolls. Season with toasted Sesame Seeds if desired. This was something new and different for me to try, and I actually had fun making them. And the taste? Well, I impressed my daughter. Her first reaction was “OMG! Those look incredible! “. And according to her, the taste was every bit as good as a pricey Sushi House. So there you go, Homemade Vegan Sushi. 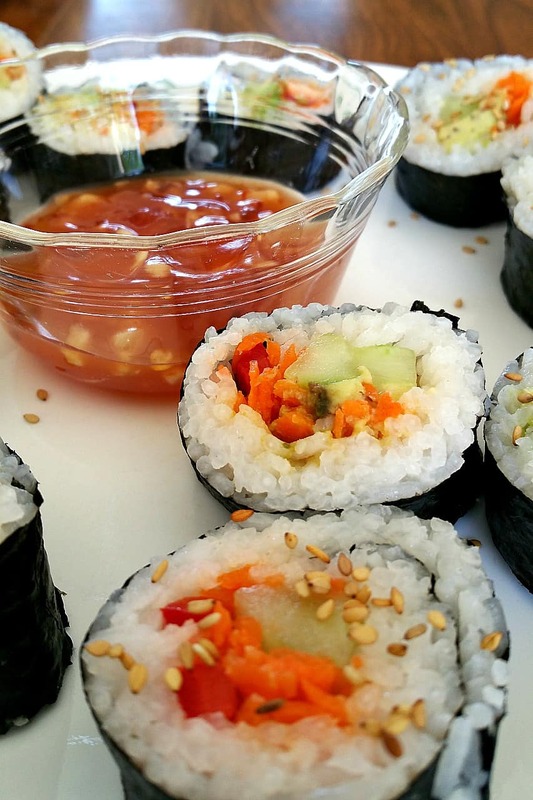 Healthy, kind of easy to make once you get the rolling part down, and very economical compared to a Sushi Restaurant. 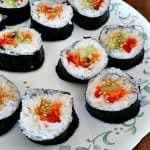 Homemade Vegan Sushi Rolls are a healthy and economical way to enjoy sushi using vegetables instead of seafood. Same great taste at a fraction of the cost. With rough side facing up, apply rice to nori sheet covering all edges. Apply rice 1/2" thick and leave top 1" of Nori Sheet bare. Layer veggies on botton of nori and with a mat, or a towel carefully roll nori keeping all veggies tucked inside roll. Season with tastes sesame seeds if desired. Use Soy Sauce and Thai Sweet Chile Sauce for dipping. I made veggie sushi rolls last weekend. I used brown rice. Yummy! Sounds good except for the chili sauce. Putting chili sauce on sushi is like putting ketchup on chow mein.